Players can use one Spring 2019 Summon Ticket to perform one Spring 2019 Summon. These tickets offer a 5% chance of obtaining a 5★ unit when summoning, so make sure not to miss out on them! A Spring 2019 Summon Ticket can be acquired by logging in daily during the event period. 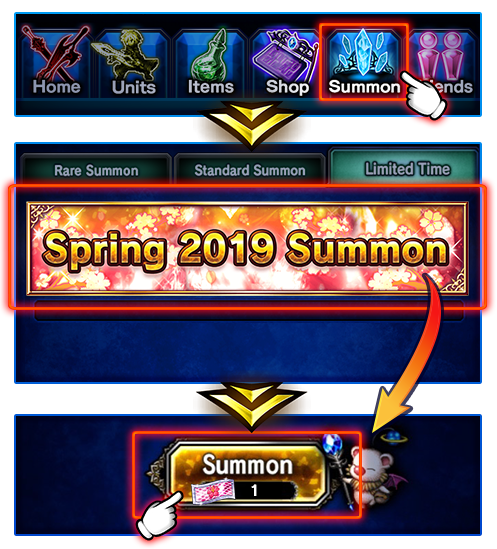 Head over to the Summon screen, select the Limited Time tab and tap on the Spring 2019 Summon banner. ** Players will have a 5% chance of getting a 5★ unit from the Spring 2019 Summon. *** This summon pool consists only of permanent units added to the game prior to April 12, 2019.